One of the LAST NATURAL LAND TRACTS close to LAKE LIVINGSTON! Gorgeous mix of hardwood trees,some pine and lots of spring blooming mature trees. Natural creek runs through prop with easy city water hook up and electric already to property. 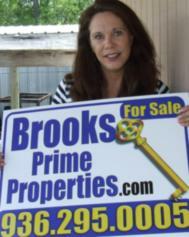 GORGEOUS VIEWS of LAKE LIVINGSTON.Perfect to build or for development. Softly rolling land that can be purchased as one tract or owner will consider subdividing. Rolling land,natural beauty. Will subdivide with good offer. Possible other two acres with charming home and landscape connecting to land with negotiation possible. HEAVEN! Driving Directions: Corner of FM 3128 and Camilla Road. Take Camilla Rd about 1/2 mile to end of dark fencing. Will see sign at culvert. Culvert follows entrance to land approx 100 yds back. Don't let the sunset on this opportunity! Private road currently being constructed to property. Let's take a leisurely tour of this magnificent piece of paradise together. For more information and pricing please contact Deb Brooks and we'll set a date!